Community engagement and capacity building will always remain a key component of the activities both undertaken and supported by Rangelands NRM – we are vitally aware that strong engagement and collaboration with local people is a key to the success of any natural resource management project. 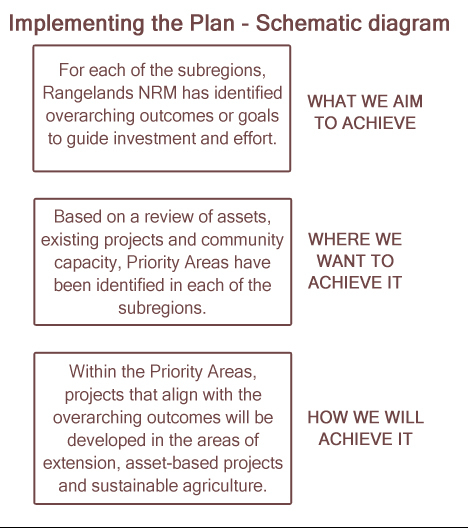 Rangelands NRM highly values indigenous land management planning and on-ground action. We acknowledge that much planning has been and is being done throughout our region, and that there are a variety of Healthy Country Plans and other plans, either private or publicly available, to help prioritise and guide the management of our natural resources. We are committed to working with indigenous groups and organisations to achieve our common goal of supporting and encourageing the sustainable use of our natural resources and it is our intention, when developing projects or assisting others to develop projects, that indigenous planning is integrated into the project development process so that we can collaborate on areas of common ground. Since its inception, Rangelands NRM has worked towards building effective and productive relationships with numerous government agencies. Many of our goals and objectives are aligned with the local community, regional stakeholders and those of state and federal agencies, Many of the assets on our Asset Register are also known or identified agency priorities. As such, the benefits of strong collaboration are obvious and we look forward to continuing to work closely with our government partners to develop and deliver projects.